“The body is the vehicle of being in the world and, for a living being, having a body means being united with a definite milieu” (84), writes Maurice Merleau-Ponty; the embodied self is “an intercorporeal being” grounded in the world, sensually fused with its beings. In his poetry, John Burnside recurrently explores human interactions with the flesh of the world, emphasising the groundedness and embodiment of his poetic subjects. The chapter examines his work, focusing on the interconnectedness of beings and the reversible intertwining of the self with landscape. An essential site in Burnside’s writing, Scotland is present through its topographical features as well as names of the local flora and fauna. Employing Merleau-Ponty’s phenomenology, I will discuss the poet’s explorations of the spatio-temporal individual’s Umwelt. I will argue that the phrase “the wider rootedness” from the poem “Appleseed” (The Good Neighbour) captures what in Sense of Place and Sense of Planet: The Environmental Imagination of the Global, Ursula Heise calls “eco-cosmopolitanism,” or “environmental world citizenship” (10). Thus, my analysis also includes an attempt to follow the poet’s mapping of extensive territories of the globe in the context of the problem of dwelling, and how it mediates place. Bristow, Tom. ‘Negative Poetics and Immanence: Reading John Burnside’s “Homage to Henri Bergson”’, Green Letters: Studies in Ecocriticism 10:1 (2009): 50–69, 51. http://dx.doi.org/10.1080/14688417.2009.10589044. Accessed 1 March 2018. Burnside, John. 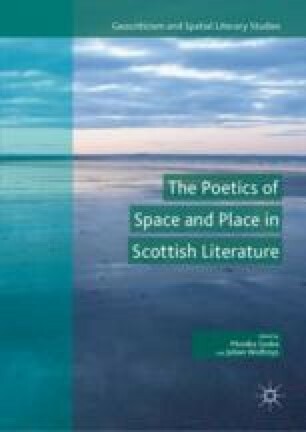 ‘Poetry and a Sense of Place’. Proceedings of the Writing and a Sense of Place Symposium. Tromsø, 15–18 August 1996. Ed. Astrid Sollid Brokke, Rolf Gaasland, Sandra Lee Kleppe, and Henning Howlid Wærp. Nordlit 1 (1997). https://septentrio.uit.no/index.php/nordlit/article/view/2208/2060. Accessed 1 March 2018, 201. Wheeler, Michael. ‘Martin Heidegger’. The Stanford Encyclopedia of Philosophy, Fall 2017 Edition. Ed. Edward N. Zalta. n.p. https://plato.stanford.edu/archives/fall2017/entries/heidegger/. Accessed 1 March 2018.